My brother Noah Pippin is a former Marine who served three tours in Iraq as an infantryman. He's currently in the California National Guard and he disappeared last summer. He left my parents' house in late-August 2010 headed back to California in a rental car but he didn't show up for his National Guard one weekend a month duty later in September 2010. The first we knew that anything was amiss was when the National Guard folks called us asking where he was. The Michigan State Police were very slow to move forward with the case which prevented us from making much progress for a fair while last fall. We've only been very slowly getting more information as time drags on. We finally found out from Noah's credit card statements and phone records that he stayed in Hungry Horse, MT the night of August 31, 2010. We then contacted the authorities in Montana and they and the Forest Service have been very helpful in trying to track Noah down. The areas Noah disappeared in are very remote and mountainous and were of course not accessible during the winter months. From what we've been told by the Forrest Service these areas will not be clear enough of snow to travel again until about now (mid-July). We know that he hiked into the Flathead National Forrest/Bob Marshall Wilderness along the Eastern route which begins in Martin City, MT 48.391057,-114.030147. That he traveled past the area of the Spotted Bear Ranger Station 47.928593,-113.526278 and through the Blue Lakes area 47.920814,-113.282154. We've recently learned that he encountered a group of hunters near My Lake 47.742036,-113.14064 on 09/14/2010 which is in the back-country of the Bob Marshall Wilderness/Flathead National Forrest/Lewis and Clark National Forrest. He told them that he was headed to the White River Pass 47.7427,-113.12047 which is many miles South of My Lake. Later he encountered a family hiking near the Chinese Wall and Salt Mountain 47.688388,-113.145103 and indicated to them that he intended to go off trail at the point 47.651166,-113.120384 on the Chinese Wall where the trail detours East to go around the perimeter of some terrain. He indicated to them that he hoped to save some time by going due South along the Chinese Wall which is a more direct route as the crow-flies. We're interested in finding people who have hiked these areas in the past or are planning on hiking them this year to ask them if they may have seen Noah last fall or if they're going to be in these areas if they could keep an eye out for any sign of him. If you can, please help us by letting other hikers know about Noah and where he was last seen. Please let me know if there's any more information that would be helpful to you or if you have any suggestions for communicating with hikers who use those areas. 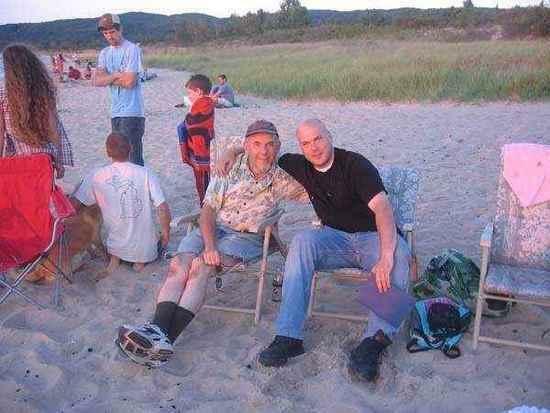 Below is a picture of Noah Pippin (Black shirt) sitting with my dad in Michigan in August 2010 not long before he departed. Caleb, sorry to hear about your brother. I hope someone will be able to help find him soon. I too am sorry to hear about your brother. You and your family will be in my thoughts, and I hope he is found soon. I am very sorry to hear this and hope Noah is found soon. I hiked through that area last year in late August as part of my Continental Divide thru hike. What kind of maps does Noah carry? A lot of hikers use commercially printed maps but we also use custom printed maps we make ourselves that contain off-trail alternates. For the CDT I printed Jonathan Ley's maps and they have the standard and alternate routes. The Benchmark Ranch is the starting point for many of the travellers to this area. The folks at benchmark are truly kind good folks that really know the area. I would contact them for sure if you haven't already done so. 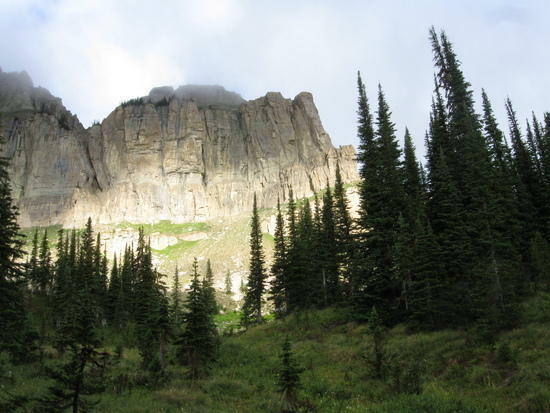 CDT thru and section hikers have boxes sent to Benchmark before heading north through the Bob Marshall Wilderness. I would post something there at benchmark to make hikers and horse people aware to be on the lookout for clues. 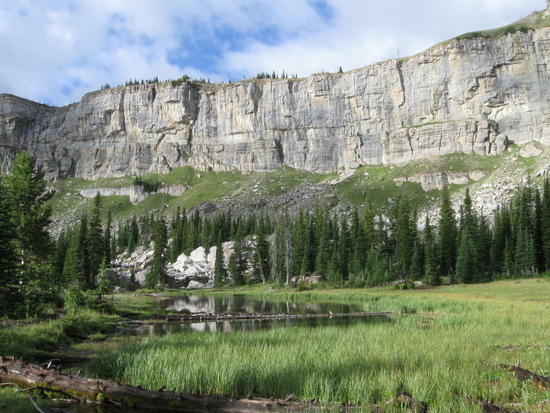 Augusta is also a jumping off point for backcountry users of the Bob Marshall wilderness. You might post a message on CDT-L. It is an email list that serves the CDT hiker community. It is a way to reach hikers that went through that area last year. You might have already thought of or done these things. I hope your brother is found soon. We don't know what type of maps Noah was carrying. We believe that he had a GPS, but he had already been on trail for 2 weeks at this point so no telling if his battery supply had held up. From the people we've spoken to who saw him on the trail he seemed to feel like he had the map issue in hand, but he was asking for advice about taking an alternate route and from his questions it sounds like he didn't have this alternate route pre-planned and it wasn't a route on his maps. Thanks for those ideas, they are quite helpful and I will follow up on them. Caleb, I have plotted the last confimed location of Noah and also the point at which he indicated he would go off-trail. What I cannot understand is where he would go off-trail in Burnt creek. I recall that area as being brushy and steep. The first picture below was taken right where the red star is on the map north of Burnt Creek. South of that point you really don't have a lot of views. There are a lot of limestone ledges and the trial descends steeply down Burnt Creek. Is Noah a peak-bagger? It seems like Cliff Mountain of Sphinx Peak would be about the only nearby peaks to scale. A cross country climb of the Chinese wall would be intense. The Limestone cliffs and ledges looked inviting to me but I honestly could not see a non-technical way up while i was there. I am trying to understand what goals he might have set for his hike and where that might have led him. If he used a GPS he might have downloaded waypoints for it or created them on a home computer and loaded them into the GPS. You gave very specific co-ordinates. Did he actually tell that family where he planned to go off trail in those exact coordinates or is that an estimate? Anyhow I have posted the map with the locations. I also have a picture i took in the area last August. You have friends in the hiker community whether you know it or not. I am mostly a solo hiker myself. I know and accept the danger but i have to admit i always kinda block out the thought of what could happen. Or the thought of what my family would feel should something happen out there. I have also included some photos taken in the area where the family last saw Noah. 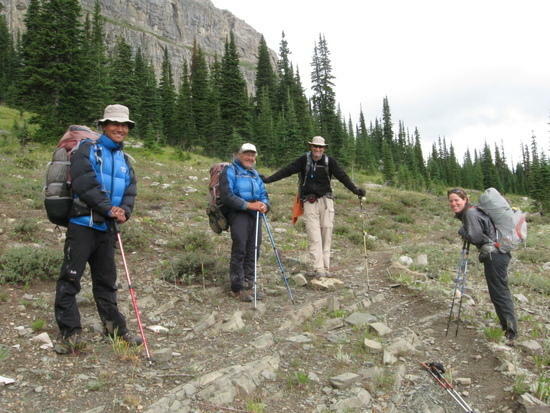 The picture with the group of hikers might be helpful. The girl resting on her hiking poles is my buddy Sage and we were northbound. The guys in the picture were all Southbounders doing a section of the CDT. I can't remember their names but the older gentleman had recently summited Mt Everest and that is his Sherpa friend he brought back from Tibet to hike the CDT. You might be able to track them down. These pictures were taken on August 23 2010. I am not sure of the exact timing of Noah's hike so i don't know if these folks could have met him at some point earlier at a resupply. Speaking of resupply, did Noah actually carry all his food for two weeks or did he plan to resupply at some point? I'm really not sure if Noah would have been interested in trying to get to the top of one of the peaks in the area. We don't have much insight into his goals at this point other than that he was headed to White River Pass. He didn't tell us he was headed up to Montana or that he was going to do a serious hike, but that's not really out of character for him to keep it to himself. The GPS coordinates are an estimate based on what the family who spoke with him told us about their interaction. In the course of their conversation he persisted in being interested in following the Chinese Wall south beyond where the Chinese Wall Trail breaks to the East even when they told him that there was no trail to the South and it probably wouldn't be a good idea. Thanks for the pictures, it's been kind of hard to get much of an impression of the area not having been there. As far as the timing I think he would have missed your friends from the photo. From what we know Noah started out from Hungry Horse, MT on about 09/01/2010 and there was a sighting of someone matching his description traveling on foot on the East access road that skirts the Hungry Horse Reservoir. His route met up with the CDT on 09/14/2010 or 09/15/2010 at Spotted Bear Pass near My Lake. There were three reported sightings between those two days. Elk Hunters spoke with him near My Lake, Forest Service rangers also interacted with him in the same area and then he met up with the family near Chinese Wall/Salt Mountain which looks to be about 5-6 trail miles South from My Lake. So from what we know he was only on a CDT segment for one or two days before he got to the area where he may have gone off-trail. Even if he continued on the normal trail he would probably only have been on the CDT segment for another day or two at most as it's only about 10 more trail miles before he would have broken off on the trail segment headed West towards White River Pass. as well as a few other items I can't recall. I appreciate y'alls thoughts and input. A search team recovered Noah's remains along the Chinese Wall within a mile of the CDT near the area where he was last seen. Caleb, I'm so sorry for your and your family's loss. My thoughts are with you all. My condolences to all of you. I hope that at least having resolution to the issue helps a bit with your grief and pain. I am very sorry for you and your family's loss Caleb. Hope that finding Noah is some comfort to you and yours. Caleb, sorry to hear of the loss of your brother. I too go by myself and don't always follow my intended plan. It's just there, ya gotta go. My condolences to you and your family, Caleb. I am very sorry for your family's loss, Calib. Take comfort in knowing he was doing what he loved, and try to think about the good times you shared with him. Caleb – so sorry to hear about this. My best to you and your family. I truly hate to hear this news. I pray that you & your family are able to find peace and comfort during this difficult time. I add my voice to the others in extending my condolences on your brother's loss. I only hope you and your family can take comfort in the knowledge you now have. You'll never forget him, of that I'm certain. I'm so sorry for your loss. I can only echo the sentiments of the others here, my condolences to you and your family. My thoughts are prayers are with you and your family Caleb. Caleb, this is such a sad story, and I'm so sorry to hear about your family's loss. Your brother should be honored for his service to our beautiful country.